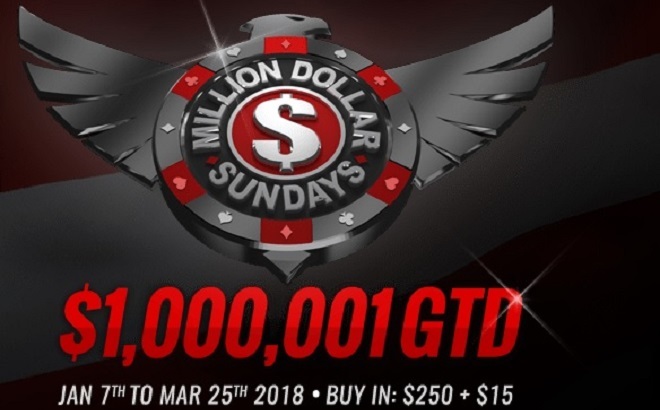 Americas Cardroom (ACR) will hold another Million Dollar Sunday February 25th at 3pm EST. With a guaranteed prize pool of $1,000,001 this will be the biggest weekly major in the online poker world. This will be ACR’s 8th Million Dollar Sunday of the year, with 4 more scheduled to follow throughout March. ACR is currently the number 1 US facing online poker site in the world. Part of the Winning Poker Network, ACR continues to provide US customers their best available option for online poker. The Million Dollar Sunday tournament will now begin at 3 pm EST, not 2pm EST as it has in the past. The buy-in is reasonable, just $265 for the chance at a huge score. Satellites are available daily starting as low as $1.10. Players will begin with 10,000 chips and play 15 minute levels. Late registration will be open through 20 levels, basically the first 5 hours of play. On the days leading up to each Million Dollar Sunday, there are also Mega Satellites with buy-ins of $22, $33, and $44 with a combined 310 seats guaranteed. So far this year, each and every Million Dollar Sunday has featured a huge overlay. An “overlay” is the gap between a poker tournament’s guaranteed prize pool and the actual prize pool generated by entrants. Overlays offer players who choose to enter these events exceptional value on their dollar. Last week’s Million Dollar Sunday tournament had 3,401 entries creating an overlay of nearly $150,000. This type of value is extremely rare to find in the poker world and should definitely be taken advantage of when given the opportunity. If you can’t wait for Sunday, remember ACR also has one of the biggest Saturday schedules in the online poker world with over $750,000 in guaranteed prize money. Spin to Get In provides another way to get into the Million Dollar Sunday tournaments while having some fun for as little as 1 cent. You can spin for 1¢, 25¢, or $1 on each spin. Simply choose your wager amount and spin the slot. Hit 3-of-a-kind, and you’ve won your seat. Plus, instead of the standard 10% rake on satellites, Spin to Get IN pays out 98% and rakes just 2%. Get in on the action, sign up for an ACR account today and receive automatic rake back up to 27%.